Navigation slider improvement: a small button was added at the far right of the taskbar to improve discoverability of the navigation slider. Also added the F4 keyboard shortcut. 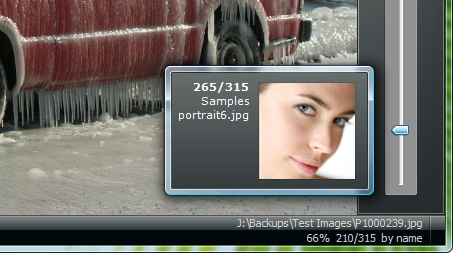 Starting from Windows Vista the program displays a preview thumbnail while the navigation slider is dragged, making it easier to figure out where one would land in the image list. This feature is fully integrated and works in harmony with the OS's built-in thumbnailing system, i.e. the thumbnails will already be there (and displayed nearly instantly) if the folder was once browsed from Explorer in thumbnail view. If not, the thumbnail are extracted in the background with little or no slowdown, then stored in the centralized thumbnail cache managed by the system. They will be present if the folder is later browsed from Windows Explorer.